I can’t recall when my love for volcanoes started but I clearly remember my first visit to Mount Etna in Sicily. There had been an eruption a couple of months earlier which I had followed on television. I had been mesmerized by the images of a river of red hot lava that was slowly but relentlessly swallowing everything on its path. By the time I visited Etna the river was a large petrified black scar cutting through green vineyards and brushing past farmers’ huts. I stood there looking at the incredible contrast of colours and forms, at the regularity of man-made rows of vines against the unpredictable chaotic forcefulness of nature. With my friends we drove up to as near to the crater as it was allowed and for a moment we thought of climbing up, but we were soon stopped in our tracks by a deep rumble that shook the earth under our feet. My reaction wasn’t so much of fear, since my friend who lived locally had told us that the rumbles were a normal occurrence, but the fact is that I had never experience such an overwhelming feeling of reverence and awe. I was acutely aware of being in a place of some magnitude and mystery produced by that which is grand, sublime and extremely powerful. It was unsettling and thrilling at the same time. I reckon my love must have increased gradually. 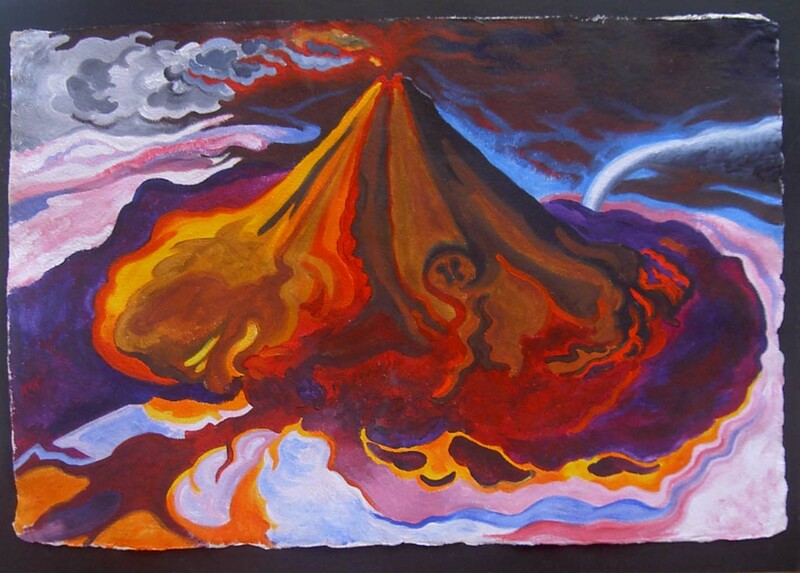 I started to look for artwork that depicted volcanoes in different stages of eruptions. I travelled to Naples where in dusty small shops I searched for prints and watercolours, leafing through dozens of folders. I bought some and brought them home to have them ready when the time to paint and draw would come. Further visits to the volcanic islands north of Sicily where also interspersed by the reading of books and articles. From my shelves I took out “The Volcano Lover”, a historical novel by Susan Sontag and read it a second time. The main character, the “volcano lover” is Sir William Hamilton, the British diplomat and antiquary envoy to the court of the egregious Bourbon monarch Ferdinand IV of Naples from 1764 to 1800. 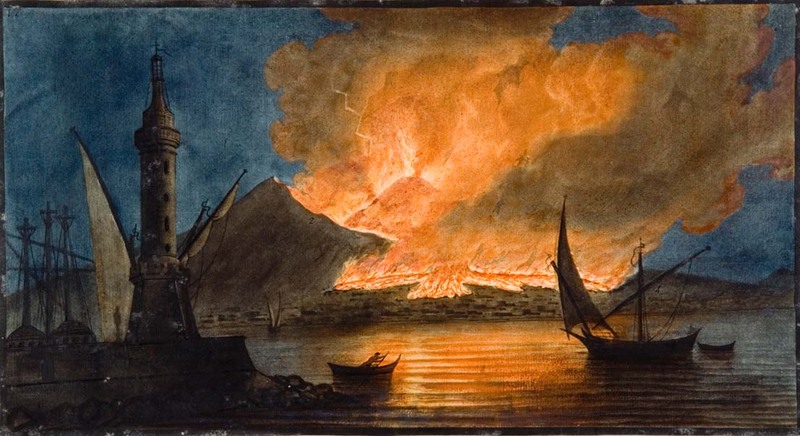 Sir William Hamilton had two grand passions, the first was the collection of art and artefacts, the second was volcanoes, and in particular Mount Vesuvius which he could see and closely observe from his house. 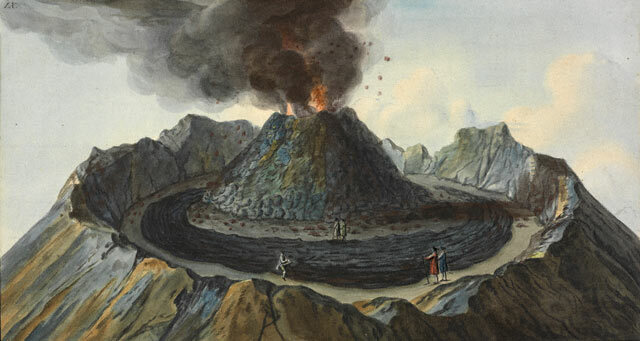 Hamilton is thought to have climbed Mount Vesuvius more than 65 times and sponsored documentation of the volcano daily activity from 1779 to 1794. Hamilton employed the Anglo-Neapolitan artist Peter Fabris to create sketches in situ to document the work. These were then reproduced in prints that were hand coloured individually by local artists by the application of gouache. The work was published in 1776 as Campi Phlegraei: observations on the volcanoes of the two Sicilies. 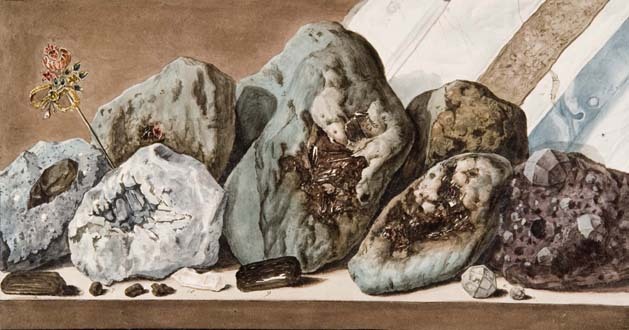 The outstanding illustrations showed the eruptions from different vantage points and depicted various rock samples. I too have a small collection of volcanic rocks: obsidian, pumice, lava and sulphur crystals and recently I have started a still life oil painting which is going to be part of my new illustrated book. While painting the rocks I constantly refer back to Hamilton’s prints pinned on the wall, wanting to be as precise as possible, almost scientific, resisting the temptation to slip into a more free interpretation of the objects. I thought I would never have the patience for such a slow, detailed type of work but I found that I like it very much and gives me the time I need to let the story come through effortlessly.